Bennett (right) finishes behind Elia Viviana and Sacha Modolo. ELIA VIVIANI MADE it a double delight in Israel on Sunday as he won his second Giro d’Italia stage in a row in a bunch sprint finish at Eilat, with Ireland’s Sam Bennett coming home in third. The Italian survived a near-brush with the safety barriers on the side of the road as he sprinted to the stage three finish in the Red Sea resort, edging out compatriot Sacha Modolo with Bennett, riding for Bora-Hansgrohe, finishing third for the second consecutive stage. Australia’s Rohan Dennis kept the race leader’s pink jersey. Viviani was perfectly placed on Bennett’s back wheel as the sprinters launched their charge to the line but just as he tried to dart out from behind the Irishman, Bennett lurched across the road. He went from the far left to the far right, almost barging Viviani into the barriers. 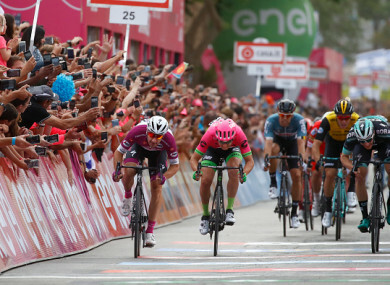 But the experienced Italian kept his cool and leant his shoulder into Bennett, who veered back to the left, leaving a channel for Viviani to burst through and win. Viviani, 29, wasn’t best pleased with Bennett but his victory proved ample compensation. The fast-finishing Modolo pipped Bennett for second at the end of the long, straight 229-kilometre stage through the barren Negev desert. Race favourite Chris Froome and last year’s winner Tom Dumoulin both enjoyed an uneventful day riding safely in the peloton to finish in the same time as the winner. Dumoulin remains in second, one second behind Dennis with Portugal’s Jose Goncalves up to third at 13sec after Belgian Victor Campenaerts lost time at the finish. “It was a very long day and a little stressful with the wind,” said Dennis. Froome remains in the top 20 with a 38sec deficit to Dennis ahead of Monday’s rest day before the fourth stage begins in Catania following the transfer from Israel to Sicily. After three days racing in Sicily, the Giro will move onto the Italian mainland, although not before the overall contenders have had a chance to test themselves on a summit finish at Mount Etna, the highest active volcano in western Europe. Sunday saw a three man breakaway go clear almost right from the start with Canadian Guillaume Boivin making it into the escape group for the second day in a row. He and Italian Marco Frapporti lasted almost 225km in the lead in scorching temperatures well over 30 degrees Celsius before they were swallowed up by a charging peloton. Ryan Mullen finished 78th and Nicolas Roche crossed in 82nd position. Email “Ireland's Bennett pushes Viviani all the way in dramatic stage finish at Giro d'Italia ”. Feedback on “Ireland's Bennett pushes Viviani all the way in dramatic stage finish at Giro d'Italia ”.